What if there was a way to mitigate the risks of an extended care event by leveraging non-income-producing assets? LTC National Sales Director Skip Liddell shows you a solution that offers LTC benefits, death benefits and helps avoid negative tax consequences. Genworth offers two webinars on several dates to learn more: Underwriting Changes and General Information on Element. Asset-Care IV gives your clients options to fit them while helping them prepare for LTC costs and providing value even if they never need LTC benefits. Are You Getting VIP Treatment From Your LTCi Marketing Consultant? 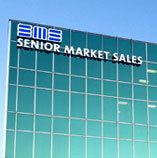 At Senior Market Sales we take care of the details ... so you can spend more time selling. This series explores options available to your clients, including traditional LTCi, linked-benefit products, short-term care and stand-alone home health care.